Hula-hooping is no longer just for kids, as adults have realized the tummy firming and calorie burning benefits. Basic hooping, which consists of spinning the plastic hoop around your waist while gyrating your hips to keep it in place can burn approximately seven calories per minute, according to the American Council on Exercise. The calorie burn will vary per person depending on your age, weight and executed intensity level. Hooping has made its way into many gyms and fitness centers across the United States as an enjoyable and efficient way to workout. Classes mix up basic hooping moves with balancing on one foot, lunges, squats and spinning the hoop on your arms, upper chest and legs. Compared to other popular exercise classes, hula-hooping was among the top calorie burners at seven calories per minute and beat out power yoga and step aerobics, which were recorded as burning 5.9 calories per minute, according to ACE. Hula-hoops come in a numerous varieties, including basic and those that are weighted, usually by 1 to 4 pounds. 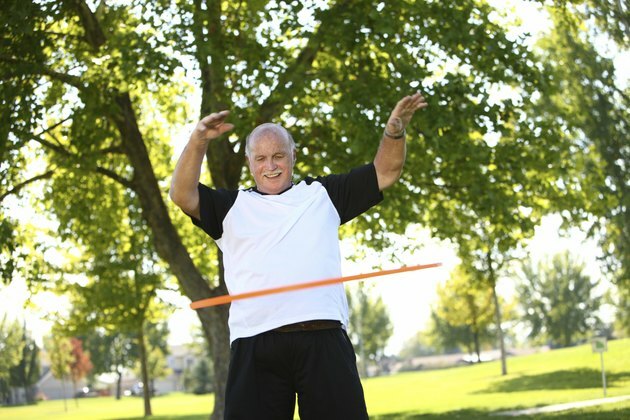 Beginners should stick with the basic or 1-pound hula-hoop to avoid lower back injuries. Consult with your physician before starting a hooping workout. American Council on Exercise: ACE-Sponsored Research: Hooping—Effective Workout or Child’s Play?